Gravitation - What's The Push Behind The Force? Newton established the equations for gravitation, but he would not speculate on what the underlying cause of the phenomenon might be. "Hypotesis non fingo", he said, meaning "I won't make any guesses", at least in public. Indeed, we are left to this day without a generally agreed definition of what we are talking about when we say "gravitation". Nieper's perisolar cushion model, as he called it at the time, was my first contact with "pushing gravity". It seems that this model goes back to the ideas of a man called Georges-Louis Le Sage who lived in the mid-eighteenth century Geneva. 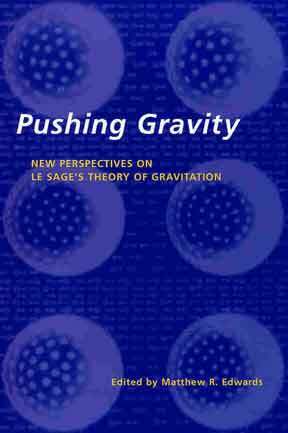 "Whereas Newton's theory and (later) Einstein's relativity were essentially mathematical descriptions of the motions of bodies in gravitation, Le Sage's theory attempts to arrive at the cause of gravity. The basic idea runs like this. Space is filled with minute particles or waves of some description which strike bodies from all sides. A tiny fraction of the incident waves or particles is absorbed in this process. A single body will not move under this influence, but where two bodies are present each will be progressively urged into the shadow of the other." There is also the anomalous acceleration of two Pioneer spacecraft on their way into the outer reaches of the solar system, which seems to tell us that our model of gravitation is not quite correct. Jaroslav Kopernicky raises the question whether gravity could be an electromagnetic phenomenon. The search for a unified field theory has thus far been unsuccessful concerning gravity. Earlier an obstacle to finding an explanation due to electricity has been the existence of electrically neutral particles with mass, e.g. neutrons. Nowadays, when also these have been shown to contain charges, i.e. quarks, the electricity model would work. If assuming that the positive end negative quarks are situated at a distance from each other, a classical "dipole electric field" would appear from them, even though the sum of their respective charges is zero, merely due to classical electrostatics. The typical behavior of dipoles also corresponds to that of "masses". They attract each other in that the part close to the center of the negative charges attract the part close to the center of the positive charges of the neighbor. Inevitably, this kind of attractive force must appear, due to Coulomb´s law, and hence the strength must be non-vanishing and thus a competitor to the "pure" gravity field explanation. Numerical calculations would be needed before accepting the "new theory." "... it appears that gravitation can be accounted for on the basis of aether dynamics, provided that the aether fluid has suitable anisotropic properties which enable the existence of specific vortex structures. The electron vortex might be adequate to serve as the fundamental material entity from which other vortex systems are assembled. Electrical charge is accounted for on the basis of the two possible mirrored vortex structures, and mass is a parameter derived from the number of gyrons participating in the vortex assemblies. This concept leads to the view espoused by Descartes that physical reality is merely an interplay of extension and motion." Compression is the source of the apparition of attractive force. Gravitational force is exerted by an overtly undetectable fluid. The fluid has nearly infinite particulate density and particle dimensions are infinitesimal. The pressure of these fundamental particles is temperature. The irresistible force of temperature has not been explained. It is quantitated as the reciprocal of the coefficient of volumetric thermal expansion. The argument is presented that the radiation pressure model of gravity is the only model that produces the correct values for the forces acting upon orbiting bodies. All competing attraction models produce values that are double the actual force which is required to maintain orbit. This force doubling paradox as detailed in this paper indicates that the Mass Attraction and General Relativity Attraction concepts are not viable models for the cause of gravity. See above URL. Shows the cause of the gravitational push and why. This work seems to copy much of work of Dr. Ricardo Carezani who has published such information many years ago. He has work, books, and a DVD on gravitons, also talking about the pioneer slowdown among many other phenomena. Is there any recognition of Carezani in the book? His started in the 1940s and continues today along with an entire society who supports and studies his works at http://www.autodynamics.org. Gee, David, unless I've completely misunderstood our dating system, mid-1780s trumps 1940s every time. Daniel Athearn comments by email, sending an article of his. Athearn argues - with Whitehead - that physics must be open to intelligible description of the various observed phenomena. "A neglected tradition of physical thought holds out promise of a true physical explanation of gravity which critically overcomes the inherent limitations of classical physical models. Faraday and Whitehead worked in the direction of a revision in the fundamental conception of physical reality which, once clarified and worked out, opens a broad prospect of causal intelligibility that is otherwise absent from physics." I am proud to say that Frank Meno is an old friend of mine. Hello Frank. I am in total agreement with Frank that all physical reality which we perceive with our senses arises secondary to the formation of Aethereal Vortices which I believe can occur in infinite manifestations and infinite dimensions. Where Frank and I disagree is on the concept of "atomism" which holds that matter is limited in its divisibility and reaches a point of non-divisibility in space and time. I don't believe there can be such a thing as an indivisible, fundamental, solid-state particle, such as Frank's Gyron. In my vision, there is no such animal as finite. Everything which appears to our senses as finite is in reality an Aethereal illusion. I hold that our boundless universe consists of an Aethereal Sea of hydrodynamic primal energy. It moves in waves, currents and vortices. It can be divided or multiplied forever and into infinity. Infinity contains an infinity of sub-infinities. However, I do believe there is something akin to Frank's solid particle gyron...To me it would be another Aethereal Vortex which is made up of even tinier Aethereal Vortices and likewise, so on, ad infinitum. Eternity as to time and infinity as to space are statements of logic which have mathematical rigor and validity. In my vision, the Aether maintains its divisible pureness and fluid character in every parallel dimension of the macrocosm and the microcosm. To understand this is to understand Zeno's paradox, a Greek puzzle which was first brought to my attention by my friend Frank Meno. Thanks again Frank. But let's get to the real root of reality. What is the origin of the force which propels the Aethereal Vortex on its axis? What causes a certain volume of Aethereal fluid to suddenly rotate? What is the root cause of the gravitational effect? How does heat,plasma, fire,light,electricity,magnetism, gravity, matter, life and logic manifest from the Aether? I feel I have the answer to these major questions which I intend to reveal in my unfinished essay "The Origin of Force." But who can I find that will publish such a work? Aetherealists like Frank and myself are considered to be dissident heretics on the fringe. Aethereal Science and Philosophy have been thoroughly rejected and suppressed by the mainstream Cult of Einstein. To them we're looney. But these so called scientists have done nothing more than dogmatize the study of cosmology. Some of Einstein's theories are absurd and retarded. If the premise is illogical, the math is moot. Despite all those hieroglyphic equations they have yet to acheive the ultimate goal of "unification" and I take consolation in knowing that they never will. Unification can only be found in the boundless Aether. That's where I found it. Eureka! You continue to ignore Autodynamics with its Quantum Universal Gravitation, which is the only theory that explain all the fenomena and with a New Celestial Mechanics with equations that go beyohnd Newton and Einstein explaining all the Observbed values in Astronomy and Cosmology. We cannot understand why you hate so mush AD. My answer was that no, I don't hate Autodynamics. I just never had an opportunity to find a simple explanation of what the model developed by Carezani stands for. If you have an article that you can point me to, that is neither too simple to be read by interested scientists, nor too complicated to be understood by a layman, I would be happy to see if I can publish it, if, after reading, I believe it would make a good contribution to the discussion of new models for the universe. Also, you are quite welcome to post a comment at the end of the article, saying what the Autodynamics view is, ideally pointing to a publicly available article that people can access on the internet. David De Hilster did so on this latest article, pointing to the Autodynamics website. It really is a question of availability of information (and I don't mean the possibility for people to buy a book), of the possibility to find out in a simple manner, what Autodynamics says about a given topic. If you want to have an Idea on AD read. "Autodynamics in one Page". Of course to "absorbe" the New Paradigm you need a lot of months after studying it carefully You cannot learn Especial Relatividad and General Relativity in ONE ARTICLE. Well, I can't invest months of study and neither can too many others, I believe. So I went and found an article on the Autodynamics.uk website, which seems to fit the bill in giving us an idea of what Carezani said about gravitation. Newton's Universal Gravitation has no underlying machinery. Its action-at-a-distance is non-temporal and has no projection in time. Einstein's Universal Gravitation is simply the space-curvature of the Minkowsky Universe. Its action-at-a-distance is temporal, without projection in time. Even though the graviton is not new, the theory elaborated here is original, regarding the overall machinery of the process. Its action-at-a-distance is temporal, and it has a projection in time. Gravitons absorbed by matter, transferring their momentum, create gravitational pressure. The action-at-a-distance is transmitted at light velocity or greater. Starting from the Mercury perihelion advance, the theory explains the perihelion advance of Venus, Earth and Mars and Binary Stars like DI Herculis and Binary Pulsar PSR J1518+4904. Graviton absorption by matter transforms matter itself. The production of gravitons by a catastrophic event is also possible. Matter evolves with time. The described mechanism transforms the second law of Thermodynamics, creating a new process for stellar evolution. For Autodynamics the entropy is constant because “singularities” of small entropy are constantly created. Due to the larger gravitational energy, the Friedmann equation is not valid and a new conception of our actual Universe must be a logical conclusion. In a later email, Lucy Haye sent a paper titled: Quantum Universal Gravitation which I have now posted here for you to see. This paper was originally entitled 'Gravity as a Mass Unit and Using Modulated Frequency Energy and Vortex Compression to Control Gravity', presented by Paul Price at the STAIF 2004 conference. This paper and presentation will deal with gravity as a mass energy entity and the controlling mechanism of vortex fields coupled with frequency modulation in various forms to extract energy and control the energy field that's produced. This concept has its origins in Einstein's Theory of relativity. This paper and presentation will show the relationship between gravity and mass. There are characteristics that show that sub atomic mass and electromagnetism work together to create the effect that we call gravity. I will show how there should be a mass function of gravity and how the mass can be perturbed creating the effects we know as inertia, centrifugal and centripetal force and how the control of gravity will nullify or maintain the effects. This paper will also show the relationship between gravity mass and black holes, dark matter as well as Zero Point Energy. This paper will attempt to show how gravity can be controlled by the use of magnetic vortex compression fields otherwise known as torsion or tordial fields creating a bow shock wave of gravitational energy that can be repelled off of, creating lift and motion. The energy needed to create this effect will be drawn from vacuum energy known as Zero Point Energy. This will be explained and how this can be used to create a propulsion system that will use the gravity mass as its reactionary energy to sustain the effect. This effect will show how the forces are unified and the controlling systems there in and how they can be controlled using artificial means also how frequency modulation can be used to amplify and transmit the energy that is extracted. I think I have found something new and interesting, which I hope you might choose to share and discuss with your Group. Consider "gravity waves". Such waves must contain some energy or some other similar characteristic related to its "strength". But waves must necessarily pass through a null in the process of inverting. Maxwell and others discovered that regarding electricity, BUT IT REQUIRED THE EXISTENCE OF MAGNETISM, and that it be 90 degrees out of phase. That is the only possible way that the energy in EM radiation can be conserved, by alternating back and forth between being electric and being magnetic. If either had existed alone, there could only have been electrostatic (DC) electricity or magnetostatics. See the point? IF there are actually "gravity waves", then there has to be some other phenomenon that must also exist (and which is currently undiscovered) which would have to be 90 degrees out of phase with gravitation, in order to fulfill Conservation requirements. So, unless someone finds some phenomenon that fills the bill, I think we may be forced to concede that only gravitostatic gravity exists. I think this reasoning provides grave concerns regarding whether "gravity waves" could even be a valid phenomenon. In my view, gravity is caused by the push of ultra long wavelength electromagnetic radiation from very distant sources. The graviton is a quantization of the "shadow" cast by masses and the gravity wave is shadow or perturbation of this smooth background caused by the mass or the movement of a mass in this background. Thus, it is already electromagnetic. Just as electrostatic effects as seen by a moving observer are interpreted by him/her as including magnetic effects, so are static gravity effects as seen by a moving observer interpreted as including "magnetic" gravity effects. These "magnetic" gravity effects are weak compared to ordinary ("electric") gravity -- unless either the source or the observer are moving at very high velocity. Michael Faraday was the first person to look for "magnetic" gravity effects (without finding them), around 1849. The rotation of the Earth sets up a weak "magnetic" gravity field, which is being studied by the satellite called the Shiff Gravity-B probe. Turning to gravity waves, the existence of "magnetic" gravity implies that there is a mechanism for gravitational wave energy to "slosh" back and forth between the "electric" and the "magnetic" parts of the gravitational field. For waves moving at the speed of light, these "electric" and "magnetic" parts of the gravitational field have equal strength on average. Most of the articles on "magnetic" gravity mentioned above primarily discuss quasistatic effects, rather than the role of "magnetic" gravity in gravitational waves. In this sense, the early work of Heaviside, which includes discussion of gravity waves, is insightful. Note, however, that the use of the terms "electric" and "magnetic" parts of the gravitational field does NOT imply any direct connection between gravitation and electromagnetism. No valid connection between these two phenomena has been established, despite over a century of speculation that such connection might exist. I should like to let you know that my new book "Gravitation and Cogravitation: Developing Newton's Theory of Gravitation to its Physical and Mathematical Conclusion" has just been published. Starting with Newton's gravitational theory and considering it as the preeminent but incomplete theory of gravitation, the author develops a fundamentally new gravitational theory with emphasis on gravitational forces, interactions and effects occurring in moving and timed-dependent gravitational systems. On April 20, 2004 NASA launched in space 4 satelites with small gyroscopes in order to test Enstein's Theory. The project was named "Gravity Probe B". The results of the measurements should have been published 16 moths after the launch but nothing is happening. I've heard that the results are not favorable fot the conformation of Enstein's Theory and that they don't know what to do now. They have to acknowlege that the theory is wrong. I have published a book on that subject. You can look inside the book on Amazon.com under my name which is: Kamen George Kamenov. thank you for your comment, which I have moved to this article on gravity, instead of the one you posted it on originally, which is about another matter. I hope this helps to get you started.